Remove cowl top and cowl top extension. Refer to EXT-26, "Removal and Installation". Remove brake master cylinder assembly. Refer to BR-32, "Removal and Installation". Remove vacuum hose from brake booster. Refer to BR-36, "Removal and Installation". 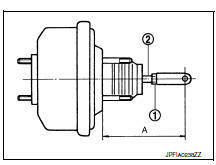 Remove snap pin (1) and clevis pin (2). Refer to BR-22, "Exploded View". Remove nuts on brake booster and brake pedal assembly. Secure the brake booster to avoid damage to components. Remove brake booster and spacer. Do not deform or bend brake pipes. If removing brake booster is difficult, remove clevis from brake booster. Remove vacuum pipe from brake booster. Remove spacer from brake booster. Be careful not to damage brake booster stud bolt threads. If brake booster is tilted during installation, the dash panel may damage the threads. Do not deform or bend the brake tubes when installing the brake booster. Always use a gasket between the brake booster and the spacer. Loosen the lock nut (1) and adjust the input rod (2) to the specified length (A). Tighten the lock nut to the specified torque. Length (A) : Refer to BR-55, "Brake Booster". Check each item of brake pedal. Adjust it if the measurement value is not the standard. Refer to BR-11, "Inspection".